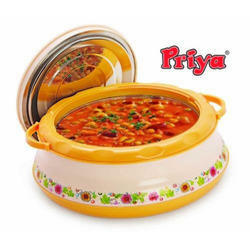 Offering you a complete choice of products which include plastic thermoware casseroles, thermoware plastic casseroles and thermoware casseroles. 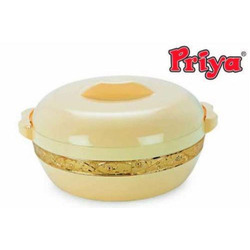 We are one of the leading manufacturers, suppliers and exporters of a wide range of Plastic Thermoware Casseroles. Manufactured using food grade plastic, these casseroles keep the food healthy, nutritious and save the effort of reheating it in microwave or oven. Besides, our range is one of the best temperature retention agents for food. 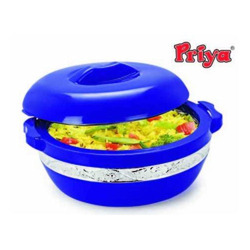 Being a customer focused organization, we are engaged in manufacturing, supplying and exporting a wide assortment of Thermoware Plastic Casseroles. Excellent quality plastic is sourced by our procuring agents to manufacture the offered product-line. Premium quality packaging material is used by our experts to ensure safe transit of the offered range. Owing to our vast experience, we have been successful in catering to the requirements of our esteemed clients by manufacturing, supplying and exporting high quality Thermoware Casseroles. To manufacture these casseroles, we procure high grade material from reputed vendors of the market. Furthermore, we customize these products as per the specifications of customers. With firm commitment to quality, we are manufacturing, supplying and exporting a comprehensive range of Thermoware Casseroles. High quality food grade plastic that is sourced from vendors of high repute is used in the manufacturing process. We employ latest machines in the manufacturing process following industry set guidelines following standards & norms of the industry. 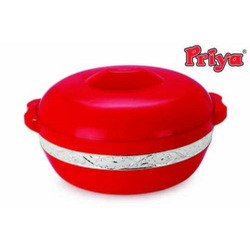 We are identified as one of the prominent manufacturers, suppliers and exporters of superior quality Thermoware Casseroles. These casseroles are manufactured in adherence with standards & norms of the industry. The material used in the manufacturing process is sourced from certified vendors of market with the aid of our procuring agents. We are one of the accredited manufacturers, suppliers and exporters of a premium range of Thermoware Casseroles. 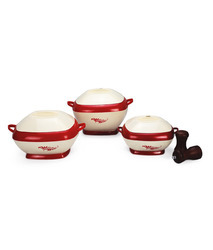 The offered assortment has stainless steel inside lids and maximum temperature retention properties. These products are manufactured by our expert professionals using excellent quality food grade plastic.